Whether your kitchen is large, or not so large, it can be transformed into a much warmer, open, and more inviting space in your home. This remodel is an excellent example of how a smaller kitchen can undergo a gorgeous transformation! This kitchen was redesigned from floor to ceiling. Beige walls have been painted to a brighter color from Sherwin Williams, “drift of mist”. A traditional subway tile backsplash has been added. New tundra colored cabinets with brushed nickel hardware have been installed, and new storage space has been made available by the extending the cabinets on the sink wall all the way to the ceiling. The floor is now covered with luxury vinyl plank flooring - an affordable alternative to tile that contrasts nicely with the pinewood flooring in the adjacent living space. The kitchen was fitted with all new stainless steel appliances, including a flat top double oven and a new half-and-half stainless steel sink with a Delta Cassidy faucet. These go well with the beautiful river white granite countertops. 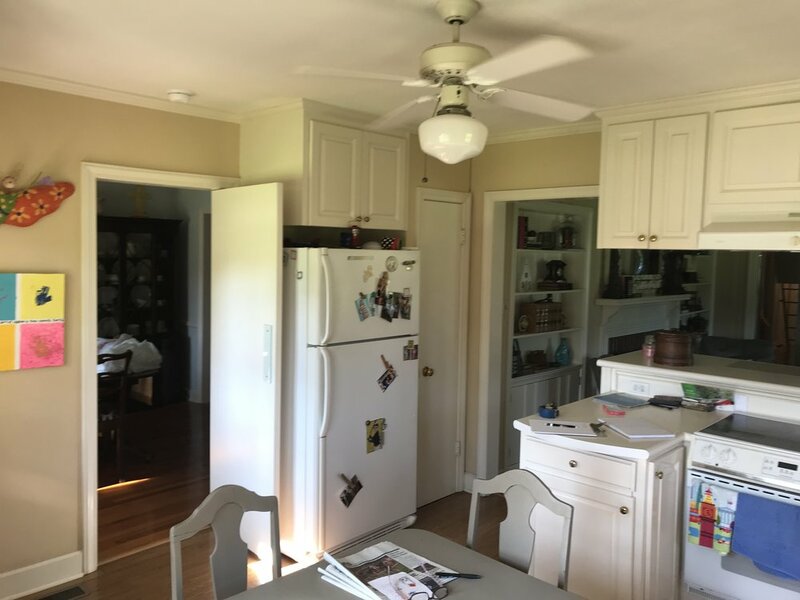 In addition to hanging a Savoy House pendant light over the sink, we also installed new can lights in the ceiling and a new ceiling fan in the center of the room. Combined with the daylight pouring in through the windows, the result is a much brighter, open, and warm feeling space. This client also opted for a built in spice rack on the right hand of the stove, and a Lazy Susan in the corner cabinet to make the best use of available storage space. To open things up further, we changed the layout of the pass-through connecting the den and kitchen. The new layout creates a more open feeling walkway, opens up floorspace in the kitchen, increases countertop space for the barstool seating, and widens the opening over the stove into the den. Additionally, we added new cabinets and hardware under the bar to match the new design in the kitchen, with new barstools to boot! The final result is an excellent use of the available space, creating an elegant and cozy kitchen!